About this time of year, we’re thinking ahead to the holidays and special occasions where we’ll be hosting others. On rare occasions (pun intended), we splurge and prepare a standing rib roast. It makes a stunning presentation and tastes fabulous. A good cut of meat really doesn’t need much more than salt, pepper, and some attentiveness. 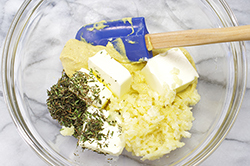 However, we do enjoy slathering an herbal and aromatic mixture of butter, garlic, and herbs on the top cap and ends. The subtle flavors this adds are just the right touch. Add a few potatoes and mushrooms to the roasting pan, add a side salad, and the meal is made. 1. Preheat the oven to 450°F. 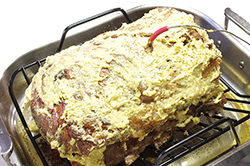 Prepare the rib roast by allowing it to come to room temperature; this will take about an hour. (When buying, ask the butcher to remove the rack of bones, trim the roast, then tie the bones and the roast together.) 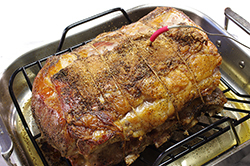 Place the roast, bone-side down, fat-side up, on a rack inside an oiled roasting pan. Sprinkle generously with the salt and pepper on all sides of the roast. 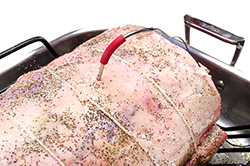 If using, (and we recommend that you do), position the thermometer probe in the thickest portion of the meat ensuring that it is not touching a bone. Roast the meat in the hot oven for 20 minutes. 2. 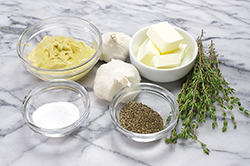 Meanwhile, in a small bowl, make a paste of the butter, mustard, minced garlic, thyme, pepper, and tablespoon of salt. 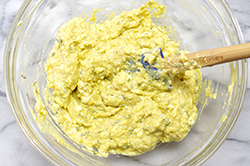 At the end of the first 20 minutes in the oven, remove the roast from the oven and slather the herbed paste over the top and sides of the roast with a spatula. 3. 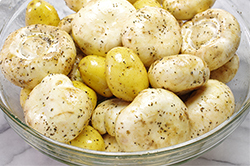 Prepare the baby potatoes and Cremini mushrooms by tossing in a bowl with the olive oil and a teaspoon each of salt and pepper. 5. 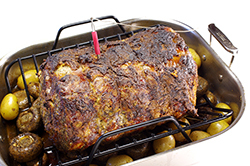 Transfer the roast to a carving board, loosely tent with foil, and allow to rest for 20 minutes before carving. Remove the potatoes and mushrooms from the pan with a slotted spoon and transfer to a bowl or platter. Skim any fat from the roasting pan, leaving any remaining juices. Add 1 cup beef stock (or enough to make 2 cups of liquid), and deglaze the pan on the stovetop. Reduce the liquid to half and serve the juices on the side. Remove the string used to tie the roast. 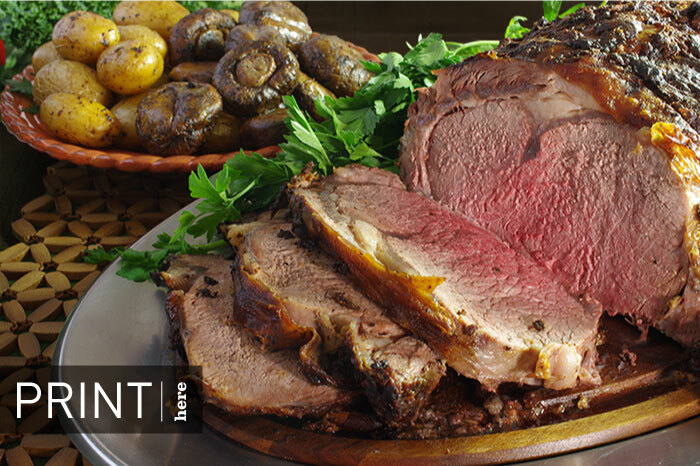 Carve the roast into 1/2-inch slices and serve with the potatoes, mushrooms, and reduced pan juices.